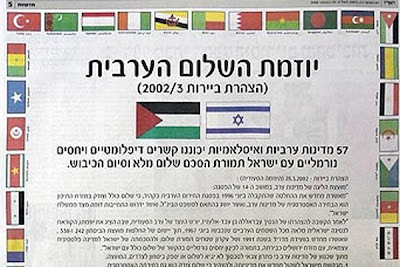 The Palestinian Authority showed unusual creativity and determination last week by placing a full-page advert in Israeli Hebrew newspapers to promote a six year old Arab peace plan. The plan was first proposed at the Beirut 2002 Arab Summit and readopted by Arab countries last year in Riyad. The initiative clearly proposes a return to the principle of “Land in exchange of Peace”. According to this principle, Arab countries will recognize the State of Israel in exchange for an end to Israel's occupation of land captured in the 1967 Arab-Israeli war. The proposition looks straightforward from the Arab side, but examining the question from the Israeli point of view involves different parameters, if not a total different logic. While The Arab initiative appears to be a proof of goodwill, and a serious step towards peace; it is echoed by suspicion and hesitation in the Israeli political sphere. The Israeli reaction to the initiative proves once again that Tel Aviv is still far from promoting a peace building culture. It also confirms that after 60 years of existence, Israel still acts according to the archaic principle that considers attack (or aggression) the best form of defense. Since it was first proposed, the Arab initiative created divisions in the Israeli political class. While the Israeli government has noted "positive aspects" in the plan without formally accepting it, Israeli President Shimon Peres praised the plan as a "sea-change" in Arab policy, and Defense Minister Ehud Barak said it could "serve as the basis" for negotiations. The real hesitations behind the Israeli position over the Arab plan rely in internal political and partisan divisions. While Israelis agree in theory that they will have to return most lands occupied in 1967, they part over two elements of the peace plan - allowing East Jerusalem as a capital for a future Palestinian state, and discussing Palestinian refugees in the context of a peace deal. It is on these two focal points that Israel will have to make hard choices and concessions in exchange for peace and prosperity, especially after it proclaimed Jerusalem (including the occupied eastern half) its "eternal, undivided" capital and rejected any responsibility for the flight of refugees during conflicts since 1948. In this context of tense internal divisions where Israeli politicians blame each other constantly for concessions made to the enemy, a simple and clear plan like the Arab initiative can easily be distorted, and the Israelis mislead and misinformed. It is interesting to see the Palestinians bypassing the Israeli political class via leading newspapers and addressing the Israeli public directly in their own language, preempting implicitly against any political manipulation of the peace initiative. Such audacity is a great starting point, but instead of being a one time shot, it needs to develop into a proper pressure tool pushing Israeli politicians towards more responsible attitudes and less hypocrisy and manipulation. However, it is still unclear whether the Palestinian Authority has a real strategy in that sense.